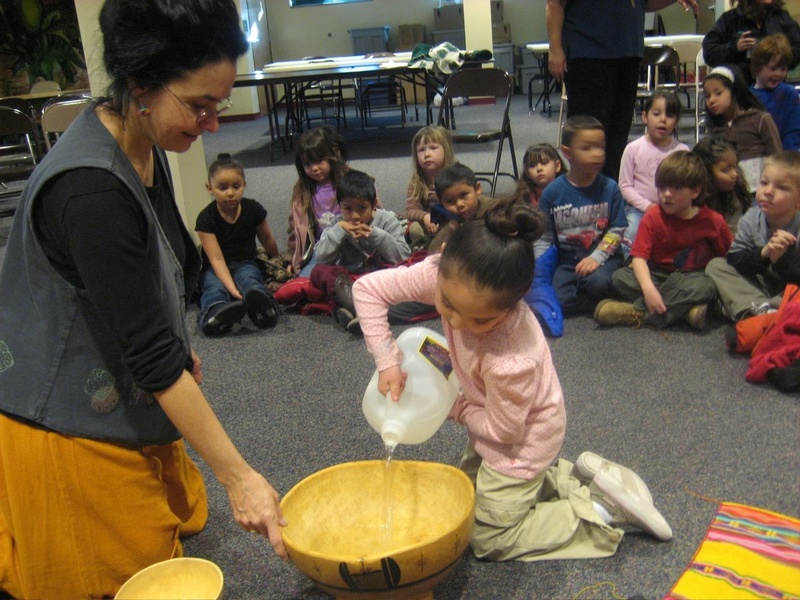 How often can you imagine someone saying: “Now it’s time to pour water into our drum”. 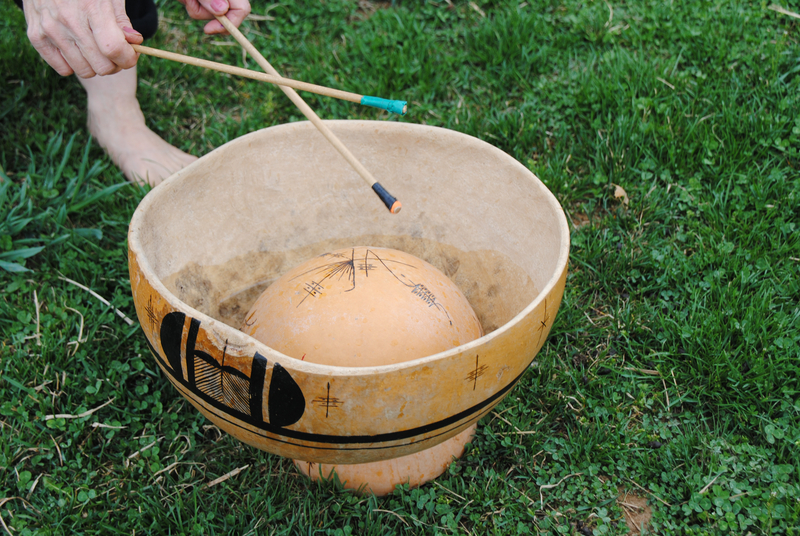 Although it might seem unusual, at least two cultures from around the globe have discovered that you can make an amazing drum by overturning a gourd and playing it while it rests gently upon the surface of the water. In fact, the sound is so deep and resonant that there are claims it can be heard for miles! Don’t have dried gourds from Ghana or a time machine to travel back to Mayan days and play a bubulek water drum? No worries. In fact, here’s a simple version of this instrument that also works wonderfully as outdoor water play for kids. It’s a good way to combine messy or wet play with creativity and music! First you’ll need a shallow container to hold the water. We’ve used a plastic “under-the-bed” storage container box, but a kiddie pool or similar container will also work perfectly. It helps to have a jug for water so you can vary the amount of water used beneath your “drum”. Then you need the floating “gourds”. 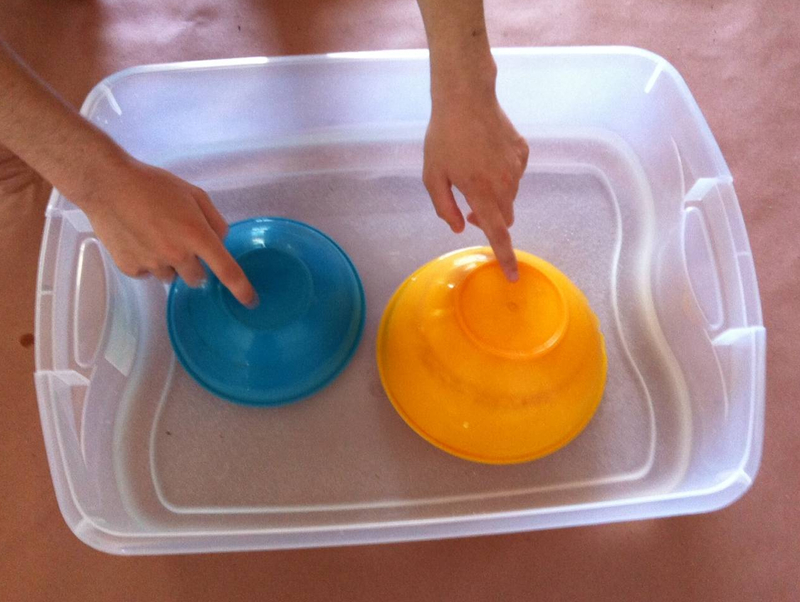 Circular items (like sturdy round mixing bowls) work best but explore whatever you have that will stay afloat when placed up-side-down in the water. You might be surprised at what sounds each different item will create when tapped or touched. Lastly, you might want to have a few beaters such as unsharpened pencils, chopsticks or wooden spoons. Then it’s just a matter of pouring and playing away. With this drum, like many others, less is more. 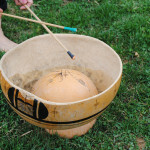 If you like, start by tapping your “gourd” with the tips of your fingers and see what sounds are created. Try quietly rapping the top and the sides. 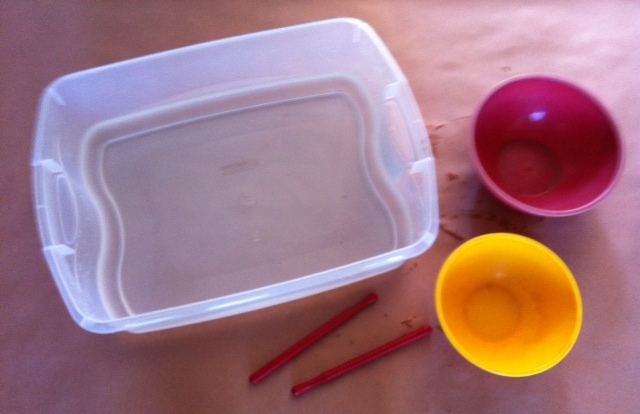 Add a pencil or a beater and see if the sound changes. 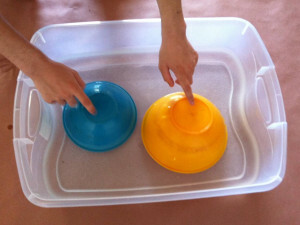 Add a different container and play two or three together for different sounds or sound combinations. If you take a look at the video below you can see the musician is doing a few different things. He’s knocking on the top of the gourd (like you might knock at a door), tapping and rapping and creating some really neat patterns. He’s playing an actual “jicara de agua” water drum from Mexico, but the same techniques work perfectly on any homemade drum. You can use this video for inspiration or create your very own unique way to play. What will your water play sound like today? This entry was posted in Early Learning With Music, Ecology/Nature, Family Fun, First Instruments, Hispanic Music, Homeschool Musical Fun, Multicultural Music, Simple Instruments, Special Needs/Kids of All Abilities, Uncategorized and tagged Bubulek, childrens music., children’s musical instruments, Ghana water drum, gourd water drum, jicara de agua, Mayan Instruments, Mayan instruments for kids, Mexican instruments, Mexican instruments for kids, multicultural crafts, unusual percussion, water drum, world music with daria. Bookmark the permalink.